Flutist Lisa Hansen has dazzled audiences and critics alike. The New York Times described her playing as “irresistibly lyrical” and praised her “considerable coloristic variety.” México City newspapers acclaimed her “beautiful ample tone,” “impeccable technique,” and “playing of radiant beauty,” while the San Francisco Bay Guardian wrote that “flute virtuoso Lisa Hansen was technically awesome and emotionally moving.” Ms. Hansen’s recording of Rodrigo’s Concierto Pastoral with the Royal Philharmonic Orchestra (EMI Classics), was lauded as “eloquent” by American Record Guide, and “brilliant” by The Belfast Times and other reviewers. Her recording of Carl Niëlsen’s Flute Concerto (Centaur) with Dorrit Matson and the NY Scandia Symphony was a “Best of the Year” selection by Fanfare, which called it “brilliant…vital, idiomatic, vigorous, exciting, propulsive, gorgeous… This is the most enjoyable performance of the work known to me, either live or recorded.” She performed this concerto with the NY Scandia Symphony at a sold-out Symphony Space concert honoring the 150th anniversaries of Carl Nielsen and Jean Sibelius. A graduate of The Juilliard School, Ms. Hansen’s major teachers include Paula Robison and Julius Baker. While a student, she won the New York Flute Club Competition and was featured in the EMMY Award-winning CBS TV special, Juilliard & Beyond – A Life in Music. Upon graduation, she assumed the principal flute chair of the Mexico City Philharmonic. Since then, she has concertized extensively in the United States, Latin America, and Europe. An avid champion of today’s music, many leading composers have written especially for her. A partial list of world premieres she’s given includes works by John Corigliano, Yalil Guerra, Katherine Hoover, Otto Luenig, Max Lifchitz, and William Mayer. She also performs and records with the GRAMMY nominated North/South Consonance and is featured soloist in flute concertos by Harold Schiffman, Stephen Yip, and Robert Martin (North/South Recordings). An active chamber musician, Ms. Hansen has appeared with distinguished colleagues at major U.S. venues and festivals including Alice Tully Hall, Carnegie Hall’s Weill Recital Hall, Ravinia Festival, University of Miami, Town Hall, Yale Center for British Art, and Festival Iberoamericano de las Artes in Puerto Rico. Ms. Hansen is flutist with the All Seasons Chamber Players, a leading New York area ensemble now celebrating its 38th anniversary. Her chamber group Serenata premiered Michael Cohen’s I Remember, based on Anne Frank’s diary, at the U.S. Holocaust Memorial Museum’s Chamber Music Series in Washington, D.C., and later recorded it on Newport Classics. Since its premiere, I Remember has been performed in the U.S., Canada, and Europe, and in May, 2015, Serenata gave its 20th anniversary performance at Temple Emanu-El of Westchester, New York. The Chicago Tribune called I Remember “a haunting, moving piece, with moments of real beauty,” and wrote that “Instrumental support by flutist Lisa Hansen . . . was on an equally high level.” (Lawrence Johnson’s review of “Concert of Remembrance” at Ravinia). 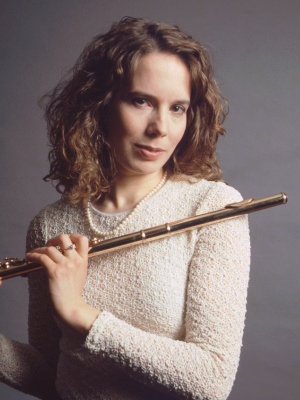 Ms. Hansen is a flute professor at Kean University Conservatory and on the faculty of Berkshire Summer Music.